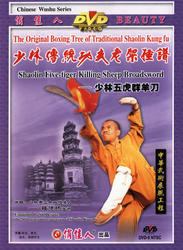 Shaolin Five-tiger Killing Sheep Broadsword is a most common weapon in the Shaolin wushu weapons. Its movements are swift and fierce, powerful and forceful; every posture is hard to defend and every form has profound meaning. Its movements have strong function of attacking and defending with strong fighting skill. It is an excellent set that is easy to learn and understand.